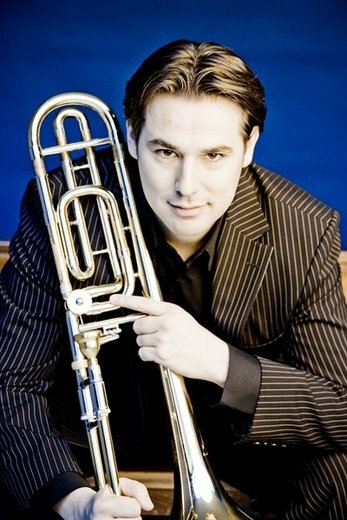 Principal trombonist of the Royal Concertgebouw Orchestra, Jörgen van Rijen is als​o much in demand as a soloist with a special commitment to promoting his instrument, developing new repertoire for the trombone and bringing the existing repertoire to a broader audience. He is a specialist on both the modern and baroque trombone. He has performed as a soloist in most European countries, as well as the United States, Canada, Japan, China, Korea, Russia, Singapore and Australia and performed concertos with orchestras including the Royal Concertgebouw Orchestra, the Czech Philharmonic, the Rotterdam Philharmonic, Combattimento Consort Amsterdam and the Netherlands Symphony Orchestra. In the coming seasons Jörgen will appear as a soloist with orchestras such as the Taiwan Philharmonic, Nagoya Philharmonic, Royal Concertgebouw Orchestra, and on tour in Japan with Michel Becquet. Many new pieces have been written for Jörgen, including a trombone concerto by Theo Verbey, commissioned by the Royal Concertgebouw Orchestra. In the season 2010 / 2011 he will appear in concerts with the Combattimento Consort Amsterdam and the Netherlands Symphony Orchestra. In the spring of 2012 Jörgen has premiered a trombone concerto by Kalevi Aho that was written for him as a commission from the Borletti-Buitoni Trust, with concerts with the The Hague Philharmonic, the Oulu Sinfonia in Finland and the BBC Symphony Orchestra. About that last concert The Times wrote: "... van Rijen and Aho turned the trombone into a fount of melodic grace and gambolling, cradled over four generous movements by an equally refined orchestra..." Plans for the future include new commissions by Florian Maier and James MacMillan. Jörgen teaches at the Amsterdam Conservatory and has been appointed International Visiting Professor at the Royal Academy of Music, London. He is also an active chamber musician. He was one of the founders of the New Trombone Collective and the RCO Brass. ​He plays exclusively on instruments built by Antoine Courtois and has released 3 CDs on the label Channel Classics.